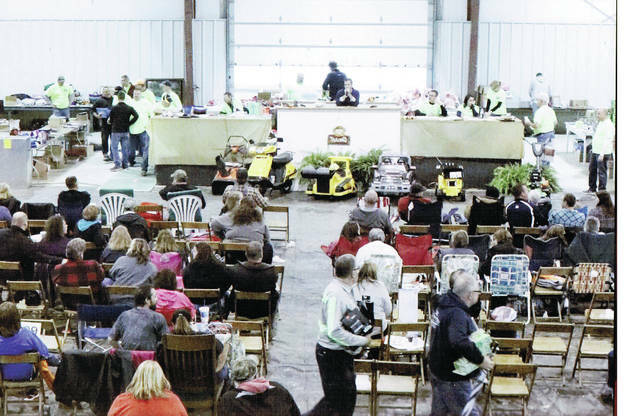 The annual Wauseon Rotary Club Auction will be held Saturday at Spangler Arena at the Fulton County Fairgrounds. There’s something for everyone, and the bidding continues into the late hours, all to benefit city parks. The 57th Annual Wauseon Rotary Club Auction kicks off Saturday, Oct. 27, at 10 a.m., at Spangler Arena at the Fulton County Fairgrounds. As with every year, the buying opportunities continue throughout the day, concluding about 11 p.m. Thanks to donations from about 200 businesses, and others from countless individuals, participants can choose from an eclectic assortment of thousands of items. Offerings this year include a car, a boat, a mini bike, guns, and a variety of gift certificates. But the auction can also offer anything from other vehicles, appliances, fishing equipment, jewelry, sports items and memorabilia, toys, yard equipment, antiques, collectibles, electronics, clothing, and furniture. There will also be a raffle for a diamond necklace. The auction is held in a festive atmosphere, with food such as pizza, sandwiches, bratwurst, and pie available at a concession stand. Typically, the daylong event raises about $80,000. Proceeds benefit Wauseon city parks, specifically at this time to complete the Indian Hills walking trail adjacent to Homecoming Park. The Rotary Club project, a 1 1/4-mile wooded path surrounded by a natural wetland, and also used for high school cross country meets, opened almost one year ago. The auction revenue will provide finishing touches such as tree plantings, on-site signage and map installation, and some excavation required to place stone fill. “All of the money goes toward the parks. If there are needs in other parks, some money will go to that,” said Bill Drummer, a Rotary Club member and executive director of the Wauseon Chamber of Commerce. About 2,000 people are expected to attend. Drummer said visitors are welcome to attend the entire auction or come and go throughout the day. The Fulton County Fairgrounds are located at 8514 State Highway 108 in Wauseon.